The airdrop process has come to an end. We are greatful to the Radium developers for ensuring a successful airdrop using their SmartChain software for file verification and identity management. We are almost certain the SmartChain will be used again by the Kekcoin community. So please, hang on to your identities! The Meme Bounty Fund has been split into multiple addresses for security purposes. These KEKs will fund bounties, competitions and community development to build on the Kekcoin project and to spread the news of its creation far and wide. The wallet GUI application and source code are now publicly available. 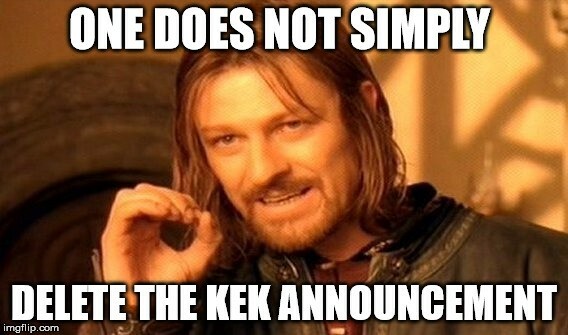 In addition we have released a media pack containing Kekcoin graphics to make your Kekcoin related original dank meme content production simpler. The Kekcoin blockexplorer can be found here. Now that the source code has been made public we can apply to exchanges. We aim to have Kekcoin on Cryptiopia as soon as possible. There will be an announcement on Telegram, Twitter and Bitcointalk so keep an eye out! Once the market has matured a little we will aim to get Kekcoin listed on more exchanges. Thank you, and Praise Kek!